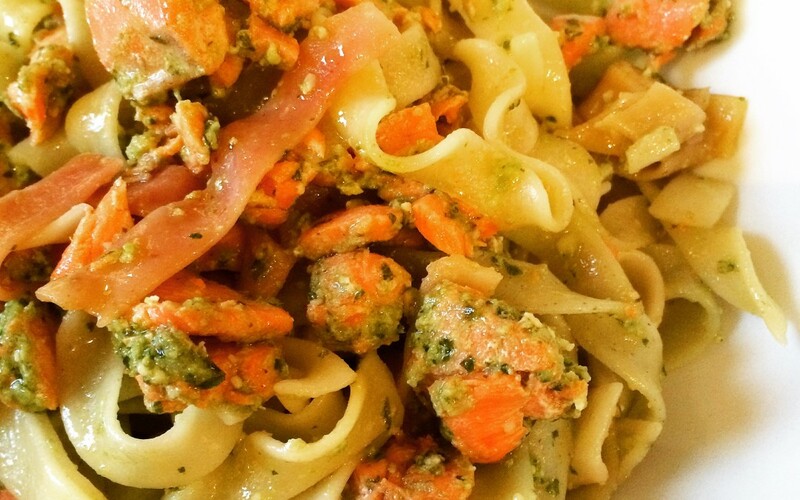 Legume pasta – enough for 3 people. I like to use Maria’s noodles. Make pesto sauce from recipe here. Make pasta as per package instructions. Drain and set aside. Place salmon in an oven-proof dish and place in heated oven. Bake for 10 – 25 minutes (depending on how thick your salmon is) then remove. Flake salmon (off from skin, if skin was on) and then place salmon, along with a few more dollops of pesto, into a pan on the stove on medium-low heat. Add pasta to the salmon and pesto mixture and use tongs to evenly distribute the sauce and salmon chunks amongst the pasta. It’s important to make sure your salmon is wild not farmed. Farming salmon can produce unhealthy fish and is also not a environmentally sustainable practice.